This week at CD Sunday Challenges Carol has chosen Dance, this give loads of scope for the challenge. I decided upon a Cabaret form of Dance, which is from a Maria G Design CD Fashion. I am hoping the close up will show the glitter I have added to the Dancer. I made a step card, I really do not get along well with measurements, I find if I draw lines and cut on a sheet of copy paper, score and fold till I get what I want, then I have a copy for my card. 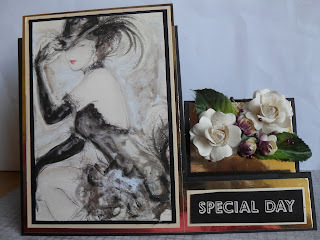 I used gold mirri card, black and cream for matting and layering. 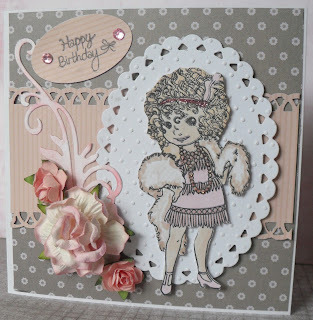 The greeting is from Time Flies a Debbie Moore Shabby Chic CD. Flowers and leaves from stash. Hint re - the flowers. As with everything that has the word craft attached to it, the item is pricey, so if you look around where artificial flowers are sold you can often pick up some bargains, as I did with the flowers I used. I love the challenge this week , so I will be even more thrilled to be visiting you to see which form of Dance you have decided upon. 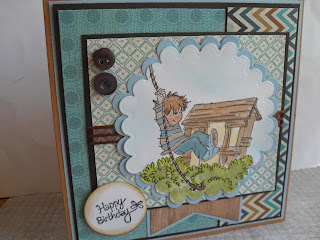 This week at Crafty Sentiments their challenge is Girl Power. 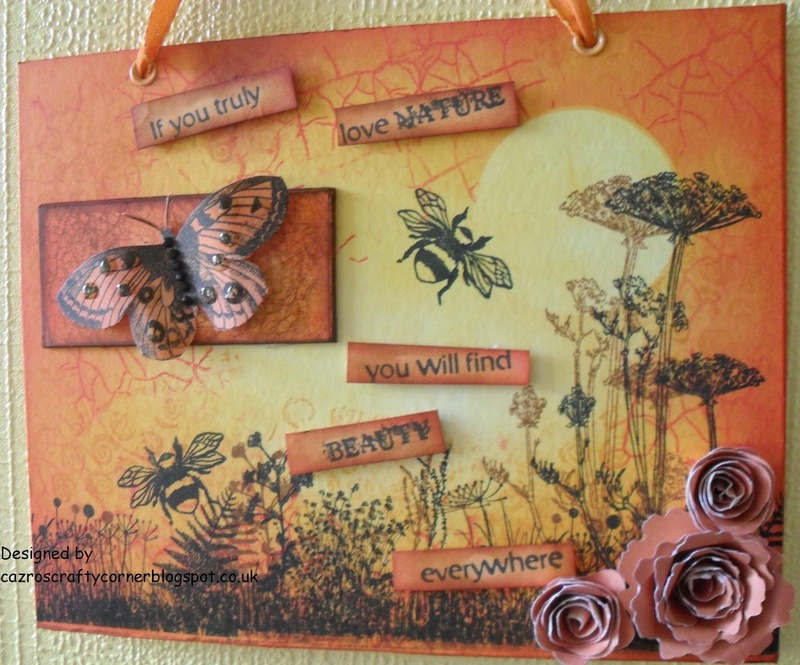 I used papers from Daydreamer Design papers, added a die cut scroll and flowers. 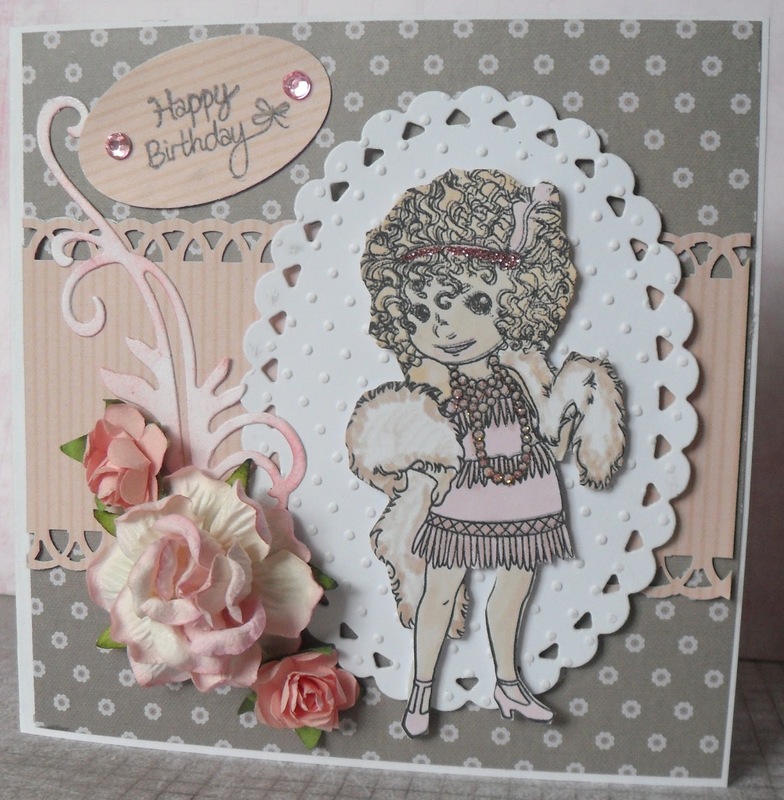 The main image is a Crafty Sentiment stamp called Jasmine - Feathers. I think she has such an endearing look, a little bit of attitude in this minx. I used Promarkers to colour, adding some glitter to her hair band and beads. NB Thrilled to add this card was chosen as the winner for this challenge, how exciting is that? Thanks to the DT. and Crafty Sentiments. Hello everyone, I'm back to crafting. I have so missed being able to create, but my mind has been elsewhere. My husband has recently been very ill, but after heart surgery he is now recovering and will hopefully be able to return home soon. My mojo has returned. I would like to thank Jacqueline and the girls on the MMM Design Team for their support and understanding during the last month or so. Back to Business. as an example of a small sized scene. 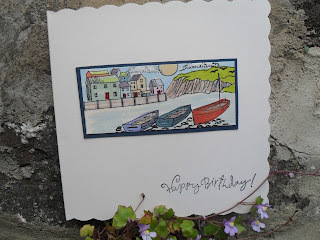 All stamps used are from Hobby Art Coastal set. STEAMPUNK. Okay, I think some of you may be saying 'What is Steampunk'? This is an excellent explanation from the CD I used from Jem's Designs - Steampunk Fairies and Friends. The Butterflies and sentiment are from Debbie Moore Shabby Chic - Time Flies CD, the remainder from the CD mentioned above. 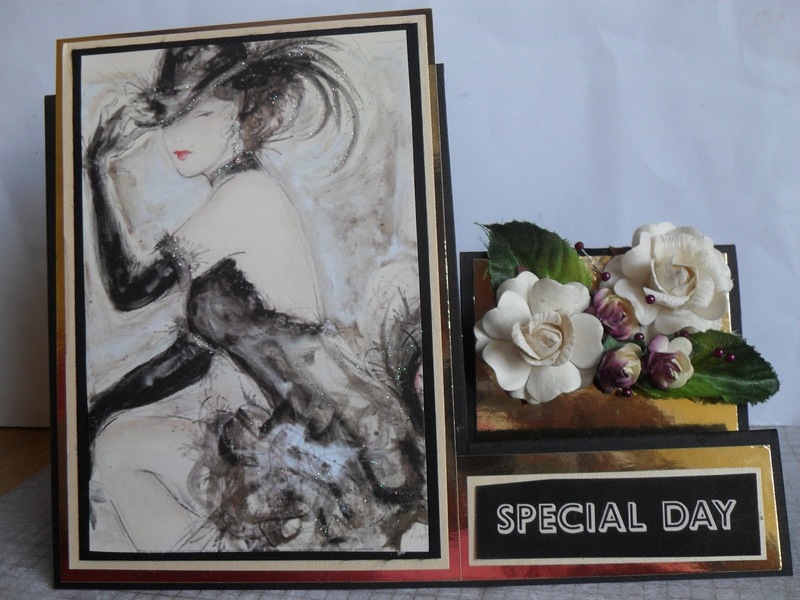 For the main body of the card I used black card, a layer of silver embossed mirri card then a layer and main image from the CD. Steampunk is an acquired taste you ether like it, get it or the you don't. I thought I'd try something different. Me, I like Steampunk, took me a while to get it but I'm a devout follower know. Waiting for another CD to arrive, can't wait for it landing on my doorstep. I'll be around to see what you found to do with the letter S.Most of all have fun everyone. At Cards for Men they have a super title for their challenge this week, ' Boys will be Boys' and as we know Men are just little boys in disguise. For my card I used some My Minds Eye papers, along with some from my stash. The main image is a LOTV stamp which I love, so typical of all boys. Thanks for visiting me, I am slowly starting to get back into making cards again. I am also entering this card to apply for a DT post for a new blog, The Male Room, which will also be concentrating on male cards challenges. There are so few around, another will help to promote what most crafters find difficul, making male cards. I look forward to again visiting you to view your Kimono projects. Thanks for visiting me and for any comments you leave. Hi everyone, I thought maybe it's time I explained my neglect of my blog. Due to a family illness, I have decided to take a break from blogging and sadly from the Design Teams which I am part of. I would like to thank everyone who I have discussed my break with, for their kindness and understanding. All being well, I should be blogging again before the end of June. Take care of yourselves and hopefully enjoy the wonderful summer weather we in the UK are all hoping for.